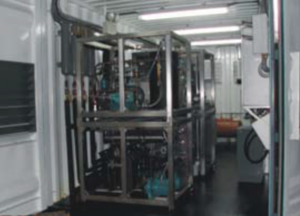 The PDC Humming Bird saturation system is a small footprint, rapid deployment, portable 6-man saturation system that is fully compliant with IMCA D024 and achieves practical compliance with IMO A17/Res 692. 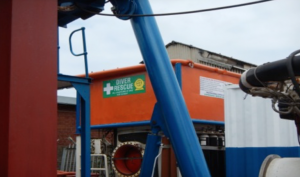 The system is ideally suited for Civils Work or Diver Training as the system had worked in the oil & gas industry successfully before. 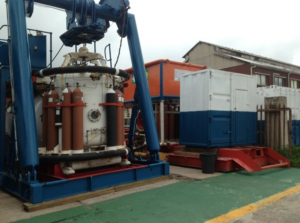 It was used in the Oil & Gas Industry for construction support and IRM work and provided an efficient, safe and cost-effective alternative to larger systems and dedicated Dive Support Vessels. The owner of PDC Grant Jameson supervised on it in 2009 while it was working offshore in the oil & gas industry and bought it when the company upgraded to a 9 man system. 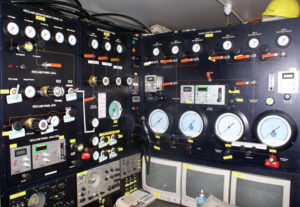 The system is rated and equipped for saturation diving to a depth of 150 msw. Fully outfitted, and ready for connection to the other components. launched off the stricken vessel. 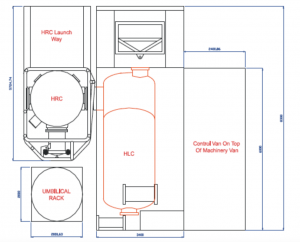 Included with the system is a Hyperbaric Rescue Control Van ( LSP Life Support Pack ) that enables topside personnel to control the decompression of the divers in the HRC from their storage depth to the surface in a safe and controlled manner, in the event the system is deployed. 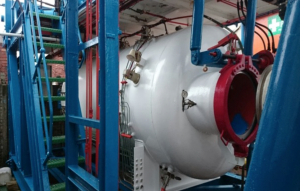 The main living chamber, TUP, LARS and SDC are incorporated on a single large steel frame skid. This framework was designed in order to lift the complete system or to enable the system to be broken down into components. The frame is strongly built and rigid in order to remove any deck anomalies on the vessel which eliminates mating problems. 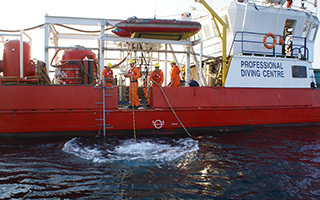 A hydraulically operated A-frame brings the centerline of the bell from its mated position to about 1.2m overboard the vessel. which the clump weight wires are reeved. The A-frame also houses the umbilical retrieval spooling device. for mating onto the TUP. Brake : Hydraulic primary brake & mechanical band brake on the drum, hydraulically operated. The system is supplied with a spare main bell umbilical. The bellman’s umbilical is not fitted with reclaim or video services. In this panel the pressure of all gases coming from the HP storage is reduced to the required value and the gases are then distributed down stream as required. The machinery Van is a Standard ISO container 20′, Mass 6.0T. 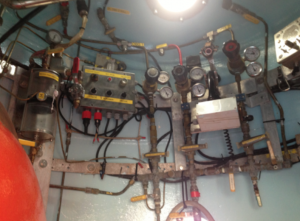 One (1) power supply line is provided from the ship’s generator to the diving system. Another backup power supply is provided from a dedicated back-up generator. Main supply to the Saturation System main switchboard for non essential services is 440v, 60Hz, 3 phase. 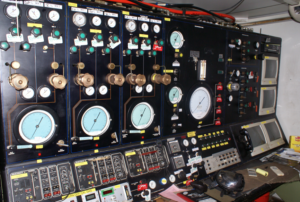 Bell and chamber distribution panel provided for all services to the decompression chambers, transfer chamber and bell control. hot water at a comfortable level to the divers. A pressure regulator is also installed to ensure the correct volume is supplied. The hot water machines are provided with over temperature and water supply failure alarms. This LSP is kept on the shore nearby operations incase the HRC is evacuated from the Barge or Vessel due to fire or sinking or any other emergency requiring evacuation. The LSP package has its own ECU system, chamber control panel and gas quads with flexible hoses to connect and carry out the decompression of the divers safely. O2 injection and O2 and CO2 analysis. 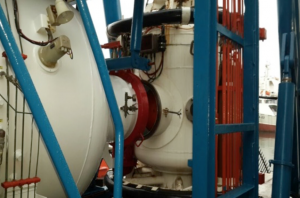 cylinder where additional oxygen is injected to make-up the required bottom mix pO2. Dive helmets used with the reclaim are 3 x 17 Divex 601 ultra jewel reclaim helmets. Is a man-riding winch, which further acts as an emergency bell recovery winch. This winch is used to lower and recover the clump weight with a single guide wire reeved from the A Frame sheaves through the clump weight sheaves and back to the A Frame. 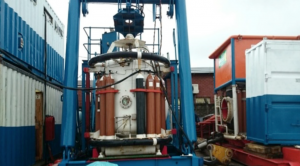 In emergencies the winch is able to lift the diving bell and the clump weight to surface. Approx 500m Wire rope : 22mm diameter, non rotating. used to guide the SDC and not allow it to twist or spin in the current. 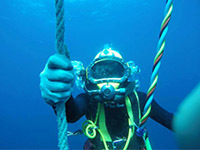 The clump weight is fitted with stores bins for tools and diver’s bailout. A bell standoff is also an integral part of the clump weight. 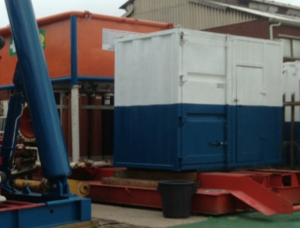 A 20ft ISO standard container, partitioned into stores and workshop. (Mass 5.5T) The fully fitted workshop is air conditioned. © 2016 Copyright Professional Diving Centre Commercial Diving School. All Rights reserved.